The initial handling of logs is the same whether they are being processed for lumber or for paper making pulp. In either case, the logs are first run over debarker rolls to remove the bark, and then they are picked up by carriage rolls and fed into band mill saws. When lumber is being processed for use in the making of paper pulp, it is taken from the band mill saws on roller conveyors first into chippers, then mixing tanks and finally vibrating screens. Mechanical and chemical pulp and paper mills both have equipment in their processes which produce high levels of vibration and shock. Fabreeka pads, washers and bushings, as well as Fabcel pads have long been used to eliminate impact shock and vibration in many pulp and paper applications including debarkers, chippers, hogs, conveyors and pump stations. 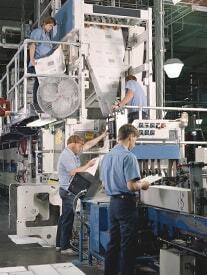 With the demand for higher quality and volume, newsprint plants use printing presses with high speeds to provide them with the competitive edge. Rotary offset presses, with standard operating production speeds of 1400-1800 rpm, can produce vibration that is transmitted through the building structure. This can negatively affect the quality of the print and the environment of the workers. Previous installations have shown that Fabreeka pads have reduced high frequency vibrations by as much as 80% in critical press applications, while remaining stiff enough to maintain press alignment and trim.